Treated with Duramass® scratch-resistant coating. Lightweight frame provides added comfort and balance. 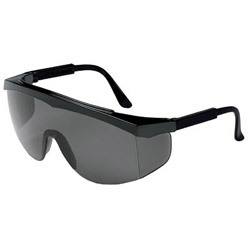 Style: Wraparound; Frame Color: Black; Frame Material: Nylon; Lens Material: Polycarbonate. Safety Glasses from Crews! 781 In Stock today.